This is a great cookie jar for Christmas! A nice big Santa with a bag of toys hoisted over one shoulder. 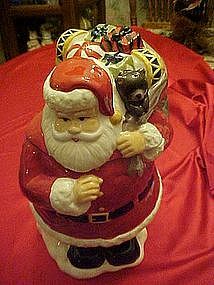 He's nice and large to hold all of those special Christmas cookies!Made of hand painted ceramic he measures over 12" tall. Pristine like new condition. Microwave and dishwasher safe too.